If I hear or read one more time that the Phoenix Coyotes are the NHL’s “feel good” story of the year, I’m gonna hurl. Team that is almost mismanaged into the ground, in a city that the NHL should never have been in, has a 100-point season. Are you kidding me? But they are connected to the potential “feel good” story of the year. The rumour mill continues to churn out the tidbit that the Coyotes are being positioned for a return to Winnipeg. You remember Winnipeg. Home to the WHA and NHL Jets from 1972-96. You remember Bobby Hull, Anders Hedberg, Kent Nilsson, Lars-Erik Sjoberg, Ulf Nilsson, Dale Hawerchuk, Dave Babych and Thomas Steen. I’d name a goaltender – but they never, ever had a really good one. OK, OK…I’ll try. Pierre Hamel, Steve Penney, Marc Behrend and Bob Essensa. Nope – couldn’t make it believable. In the World Hockey Association, the Jets won three Avco World Trophies (1976, ‘78 and ‘79). Their 17-year NHL existence was a little less noteworthy. Their best season was 1984-85. They finished the regular season with 96 points – but they were swept in the Smythe Division Final by the powerhouse Edmonton Oilers. 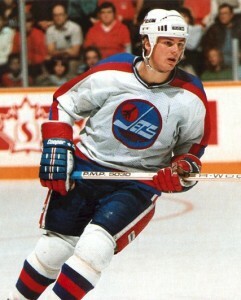 Throughout the decade of the 1980s, former NHL enforcer John Ferguson was the face of the franchise. Like Fergie or hate him, there is no doubt that the guy put every ounce of testosterone he had into trying to make the Jets a power again. Never happened. In 1996, weasel owner Barry Shenkarow culminated two years of trying to peddle the Jets by selling to Richard Burke and Steven Gluckstern (coulda used Jim Balsillie’s misguided enthusiasm then). They relocated to Phoenix – where sports fan were clamouring for an NHL team. Does sarcasm translate in type? The Jets’ home rink, Winnipeg Arena, is now a parking lot. The AHL’s Manitoba Moose play out of 15,015-seat MTS Centre. Not big enough for the NHL. There would certainly be obstacles to overcome. But it did make me feel good to think about the Coyotes moving back to Winnipeg – a city that got fully screwed by the NHL fourteen years ago.